For several years now, we’ve noticed an increase in the number of supermarket trolleys that end up in the Huruhuru Creek and the nearby culvert that runs into it. Our group members regularly report them to the local supermarkets on Lincoln Road Henderson (Countdown and Pak ‘N’ Save) as well as to Auckland Council. We understand why people choose to take the trolleys home, e.g. they don’t have cars to transport their groceries but there’s no incentive to return the trolleys so they are left on the street. Often these trolleys are then pushed into the creek before the supermarkets get around to picking them up. Once in the Huruhuru Creek, they can easily be dragged into deeper water as the creek is tidal and surrounded by mangroves. The job of retrieving them then becomes very difficult. We would like to see some action from the supermarkets to encourage people to return the trolleys, for example a coin deposit ($1 or $2) which is required to release a trolley from the rack and is then returned when the trolley is taken back to the store. The trolleys are valuable and surely it’s better that they are returned rather than being left on the street and then polluting the water ways. Sometimes they cause obstructions, which result in the formation of dams as other plant material and debris piles up behind them. We contacted the Western Leader to see if they had any interest in publicising the problem and were delighted that they were keen to do a story on the problem. This issue is not unique to our area as we’ve heard from people living in other areas, e.g. Northcote, that the same thing is happening there. 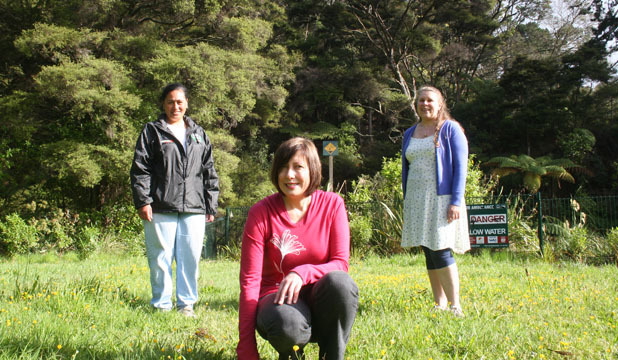 We were delighted to be awarded $500 by the Henderson-Massey Local Board after applying for funding to support the Keep Waitakere Beautiful fruit trees that were planted adjacent to the Woodside Community Garden in 2011. Most of the trees have survived though there have been a few casualties. Two of the avocado trees and one banana palm succumbed to the frosty weather that we get sometimes and several of the feijoa trees and one plum tree were annihilated by the lawn mowing team. The document attached Woodside Res 1 Final is the original council plan. We’ve added a few Abyssinian banana palms to the mix. However, we’ve recently agreed a plan with Huw Hill-Male from Parks West. He has suggested allowing grass to grow between the trees and encouraging beneficial plants to flourish which will have the effect of encouraging our beneficial insects, providing important trace elements to the soil and preventing further damage to the trees. We expect that it will also look very attractive, which will be an added bonus. So, thank you Henderson-Massey Local Board for the funding.